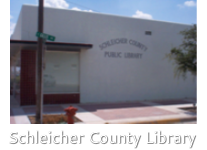 The Schleicher County Public Library is located at 201 South Main Street in Eldorado, Texas. The library provides free services to nearly 3,000 residents living in Eldorado and Schleicher County, Texas. With a collection of over 18,000 books, audios, and videos, you are sure to find something that interests you! Our friendly and professional staff is eager to help. Welcome to the Schliecher County Public Library!